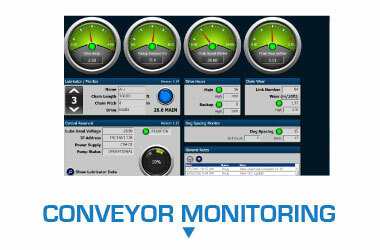 Reduces downtime while it cleans your conveyor system. Cleans chain, trolley wheels and trolley brackets. Fits every size of overhead monorail or power & free conveyor. Designed for applications where moisture and humidity is prevalent, due to santitary wash-downs or exposure to manufacturing processes, the OP-8 Wash-Down Duty Conveyor Chain & Trolley Wheel Cleaner reduces downtime while it cleans your conveyor system. Cleans chain, trolley wheels and trolley brackets. Fits all sizes of overhead monorail or power & free conveyors, and drop finger slider conveyors. Split brush shafts for easy, one-bolt removal of each brush assembly. 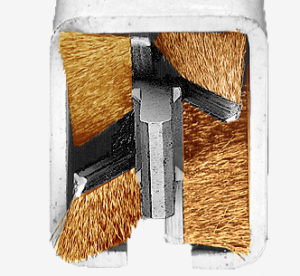 Replacement brushes can be purchased assembled for one-bolt installation of each side. 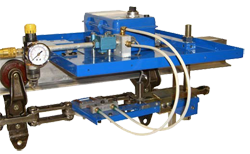 The OP-55 Pneumatic Chain Pin Cleaner is an effective and low-cost cleaning system for Overhead and Inverted Rivetless Chain applications.